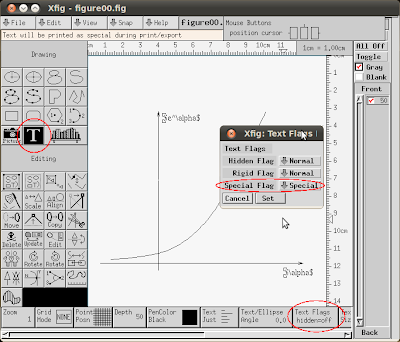 this post is to explain how to insert mathematical formulas in figures created with XFig when using PDFLaTeX (and therefore when PSFrags is not an option). The procedure is actually so painless that I would recommend it even when PSFrags is available. when inserting the text in XFig, make sure you set the "Special text" flag. This can be done even after inserting the text by opening the Edit dialog window. You can mix normal text and math with the usual $ symbol. instead of exporting to PDF, export as "Combined PDF/LaTeX (both parts)". This will create two files figure00.pdf and figure00.pdf_t (assuming the name of the XFig file is figure00.fig). Some text before the figure.